The Everett AquaSox are inviting fans to join the MVP Club presented by Jersey Mike's of Everett. 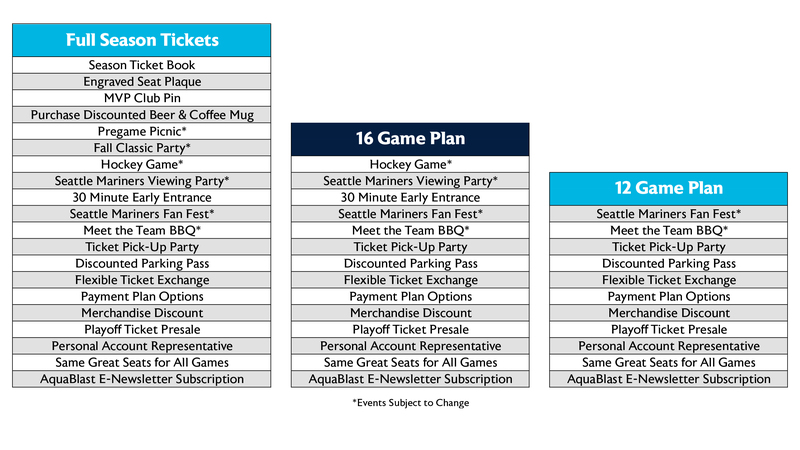 With many of the same advantages as previous seasons, MVP Members will have great benefits to enjoy AquaSox experiences all year round! To join, members commit to enjoying 39 home games in one of three great seating locations (Diamond Club, Field Box, and Upper Box seats). Click here to purchase your Everett AquaSox Season Tickets online! ∙ Ticket exchange program lets you exchange unused tickets to any future game so that no ticket goes to waste! Can't make every game? Our Mini-Plan Ticket Plans each feature top games in 2019! And if you can't make a game, no ticket goes to waste with our Ticket Exchange program, the most flexible ticket-exchange plan in baseball. We can even help you create a completely customized plan with your choice of games! Our Ticket Plans give you the same seat for all of your selected games! Click here to purchase your Marquee Family Plan online! Click here to purchase your Marquee Weekend Plan online! Click here to purchase your Friday Night Lights Plan online! Click here to purchase your Saturday Night Live Plan online!